Some designs are so ingrained in American culture that they'll always have a home in our living rooms, our nurseries, and our bedrooms. 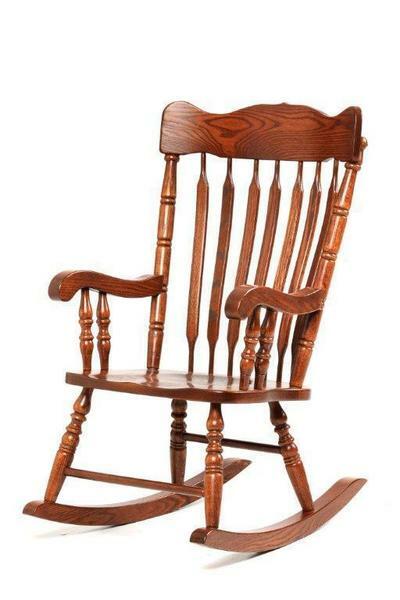 The Grandfathers' Rocking Chair - a beautifully traditional Amish rocking chair that perfectly captures all of the best elements of classical woodworking and design - is one of these timeless pieces, showcasing a classical look and an incredibly comfortable experience that will continue to provide a relaxing, safe haven for your family for generations to come. The Grandfather's Rocking Chair's elegance comes from the rich heritage behind each turned leg and hand-sanded surface. This piece will look just as fitting and inviting in the grandkids' nursery as it will in the kids', and its handcrafted solid wood construction means that it will offer every generation exactly the same kind of comfort, safety, and relaxation as it did the last. Whether your companion in the Grandfathers' is a baby, a book, or simply your own thoughts and a quiet evening, this rocking chair will provide exactly the right kind of comfort. Use the menus above to customize your rocking chair. The dedicated Amish woodworkers who craft your chair take a great deal of pride in their work, and are always open to custom orders - if you've any questions at all, or if you'd like to talk about custom work, please don't hesitate to get in touch by phone or by email.